There’s nothing like going to a nice hotel or renting a holiday home and enjoying the amenities you usually don’t have access to. For some, the thought of special accessories means a real fireplace or a double oven. Others may dream of one day owning a swimming pool or a large garden. Whatever the home details you dream of most, don’t forget to add a towel warmer to your list of things to upgrade your space with. Towel warmers are pretty common features in hotels around the world. But, there a certain sense of luxury that comes with having one in your home! Here is how easy it is to get your hands on a towel warmer and all the reasons you shouldn’t wait any longer to order one. Towel warmers come in all shapes and sizes. They can be a standard rail, similar to the rungs of a ladder, that hang on a wall. 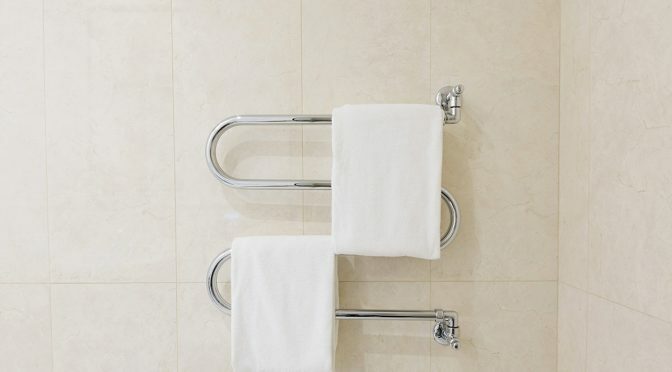 Towel warmers can also look more like coat hangers or stand alone on the floor. The right towel warmer design is one that looks beautiful in your bathroom and works well. There are two basic systems on which a warmer operates. The first is a hydronic process, a fancy word that for most will mean it’s part of your central heating system. When a towel warmer is hydronic, it uses hot running water to heat the metal bars on which your towel rests. This works just like a radiator, providing a constant flow of heat when you need it and saving energy when you don’t. The other form of towel-heating is electric. This is when a warmer runs on its own system – independent of the water running or other heating methods in your home. The warmer is operated with an on/off switch or thermostat. The switch will heat wires (dry) or oil or water (wet), depending on the mechanics within the rails. Each system will have its own installation requirements. But, it is easier than you’d think to install a towel warmer on your own. Once the warmer is ready to go, it’s time to reap the benefits. Trust us, there are plenty, but our favourites are listed below. There is nothing worse than getting into a hot, steamy shower, only to freeze as soon as you get out. If you’ve ever taken a shower when the weather is even just a little chilly, you know how this feels. Thankfully, the days of fighting the cold while you’re wet can be long gone with the help of a warmer. This luxury ensures your towels and robes are ready to go as soon as you finish washing off. They beat the old “towel in the dryer” trick because you can enjoy a long shower without worrying about the fabrics losing heat. More so, you can grab your towel as soon as you get out of the shower! No more running to fetch something out of the dryer in another room or waiting for someone to grab it for you. All you have to do is set up a warmer in your bathroom and enjoy. Beyond the cosy benefits of a warm towel, the overall added warmth is worth mentioning. When a warmer for your towel is running, it is actually heating the whole bathroom. This is because the hot air spreads throughout the space, considering most bathrooms aren’t very big, and people usually shower with the door closed. Such details mean the heat from a warmer is trapped, which warms up your tile floor, to a degree, of course nothing is better than underfloor heating for that. The extra heat allows for significantly more mobility than trying to dry yourself off while standing on a small shower rug. It also means you don’t have to tip-toe around your own bathroom. Additionally, the heat helps combat a huge safety concern for most homeowners – mould and mildew often the result of ongoing condensation problems. Such proactive measures are made possible when used towels dry faster. The quicker a warmer dries your towel, the less of a chance bacteria have to develop on the fabric. Same goes for mould that may gather in your shower tile or bathroom floor. When the heat spreads and makes you more comfortable, it is also fighting unwanted particles as long as the space is ventilated too. Whether for a warm towel or a bacteria-free bathroom, a towel warmer offers a lovely design detail. This is something anyone can enjoy. Warmers can be elegant as well as simple. They make your bathroom more luxurious without being show-offy or too bold. Not to mention, there are many different looks to choose from! Some towel warmers are small, simple rails that can go on pretty much any wall space. Others are beautifully sculpted designs that are made to be noticed. Either way, you are sure to be pleased with how one warmer can blend into the rest of your bathroom’s design. It makes all the difference for physical comfort and visual appreciation. The hardest part of owning a towel warmer is choosing which one you want! This often comes down to the aesthetics mentioned above, although different prices may play a role in the decision as well. Once you’ve bought and installed your warmer, though, you can trust it will stay up for a while. Both systems are fairly simple to run and maintain. They require little tuning and improving over the years. This means you get all the benefits you desire now at the least amount of responsibility later. Do be sure to consider the correct BTU requirements for your bathroom space before purchasing. Although you will have little to worry about when it comes to maintaining your new warmer, you may decide to take on other bathroom projects. Such ideas could be anything from re-doing the shower tile to getting brand-new sinks or shower space entirely. Maybe it means making room for the vanity unit you’ve always wanted or adding a free standing bath you could soak in all day long. Whatever your bathroom design dreams are, our blog can help you turn thoughts into action. Should You Turn Off Radiators in Rooms You Don’t Use?